How was your weekend today? Did you get some Christmas shopping done? I’m so behind on everything. 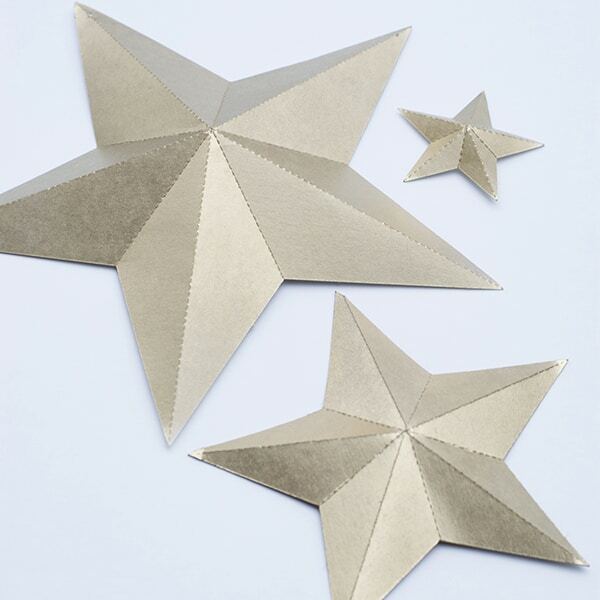 I thought today I’d share with you how I made all the gold 3D stars you saw throughout my Christmas tour last week (click HERE if you missed it). I’m sure this has been done over and over already in blogland but I’ll write about it anyways. It’s definitely not mindblowingly new but they are one of my favorite accessories I added to my tour this year. I have always liked stars and they are perfect for Christmas. I had a large amount of poster board stashed in the basement. You can buy several sheets at our grocery store for very very cheap (I think 8 sheets for $2.50) and some of the stars were even made from cereal boxes I had in our recycling bin. Now I’m lucky enough to have a silhouette cameo at home who cuts and perforates all the lines for me but it is totally doable without the silhouette machine and all you need is a star shape to trace (HERE is a printable version to download), crafting knife and cutting board. I tried it and it works to. It’s just a little more time consuming that way because you lightly have to score the areas you want to fold with the crafting knife. Click HERE to download my 3D star silhouette file so you can make your own (let me know if the link is working for you). Make sure that you set the thickness and blade appropriate for cardboard before sending the poster board through the machine. And you obviously have to cut the poster board to the size of the cutting mat before being able to feed it through the silhouette cameo. ). I actually wanted to use copper first but decided on gold last minute since I had already painted some Christmas balls copper. I wanted to mix more metallics. I made several different sizes. You can resize the stars in the silhouette file to whatever size you want. Here they are in our home. They make such a big statement for a small amount of money. If you are wondering about the little tree skirt, it is my painted dishtowel which you can read about by clicking HERE. 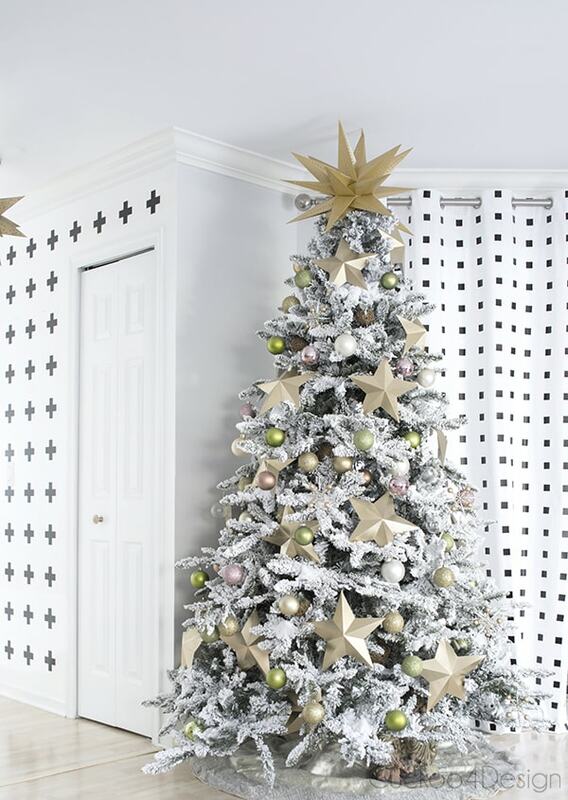 And the gold stars match perfectly with the gold Ikea star tree topper. They are totally made for each other. I feel like it was so easy and they make such a big difference. None of the trees would look the same without the stars, don’t you agree? I hope you like the stars as much as I do. I am going to try your print outs with some poster type paper that I got from a beer suitcase. I am hoping it will be easier to cut. I love stars myself. And I am hoping to make a tree tooer by roling up a poster board into a small tube. Wish me luck. Yes I am wishing you lots of luck. THESE ARE GORGEOUS!! Ahh, I love them Julia! And your tree is heart stoppingly beautiful. these are so beautiful and i LOVE how they look on the table setting!!! Oh my goodness all your trees are beautiful! I totally agree, the stars look awesome! Super cute and such a fun project. I need to get one of the cameos I’ve heard great things! Julia! Those are incredibly beautiful! Very cool! The perforated lines are probably the best part of it all. That little machine can do anything! Haha, yes it can. The perforated lines make it so so easy. These are STUNNING! I’ll be sharing this on my FB page. Oh thank you so much Amy. LOVE the stars, but I couldn’t get the link to work. Would you kindly email the download to me? Hmmm, I wonder why and I sure will. Thanks for letting me know. Wow, the power of paper! They look great and so elegant. Your trees look gorgeous!!! I don’t have a silhouette cameo, how can i print out the pattern for hand cutting? 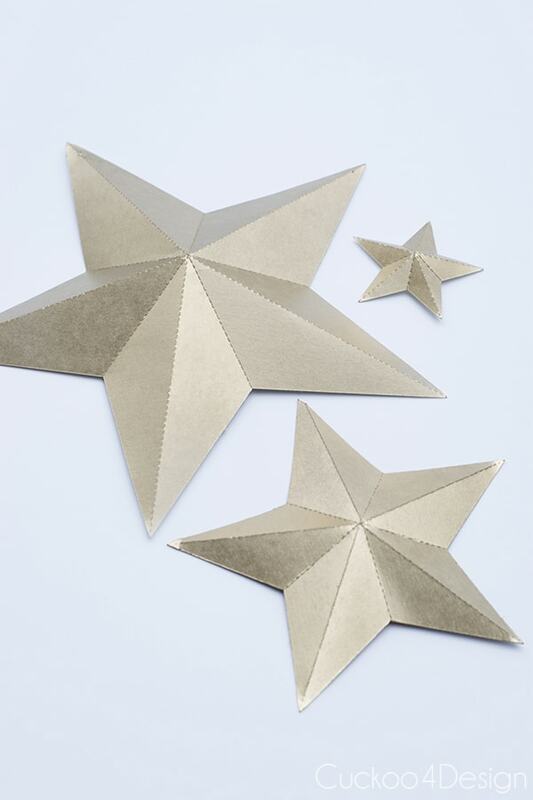 Any star shape would do, maybe I should include a star printable with various sizes to my post too for people like you who don’t have a silhouette. I hope I can get to fixing that this weekend. If you can that would be awesome! 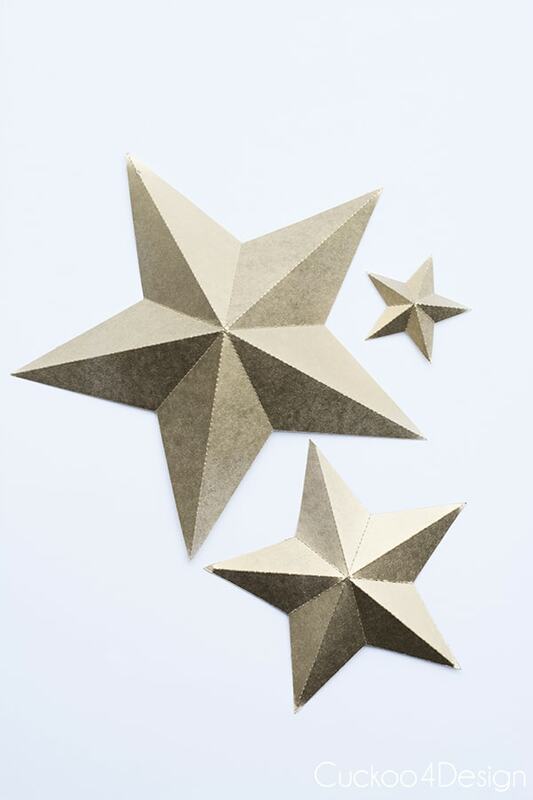 my son’s 2nd birthday is next month and i think these stars would make the perfect decor (and he loves his stars). Thanks for replying! The stars are so pretty! I’m so behind on pretty much everything when it comes to Christmas, I can’t believe its literally days away!! Oh gosh I hear ya. I’m not behind on Christmas decorating but everything else. Thanks so much! I love these!! You’re so creative! Thank you for the file!! I need to see if I can figure out a way to use these around here!! Thanks Amber, I hope downloading the file works for you. One reader told me it didn’t work for her. I am so behind – your blog hasn’t been updating in my reader. 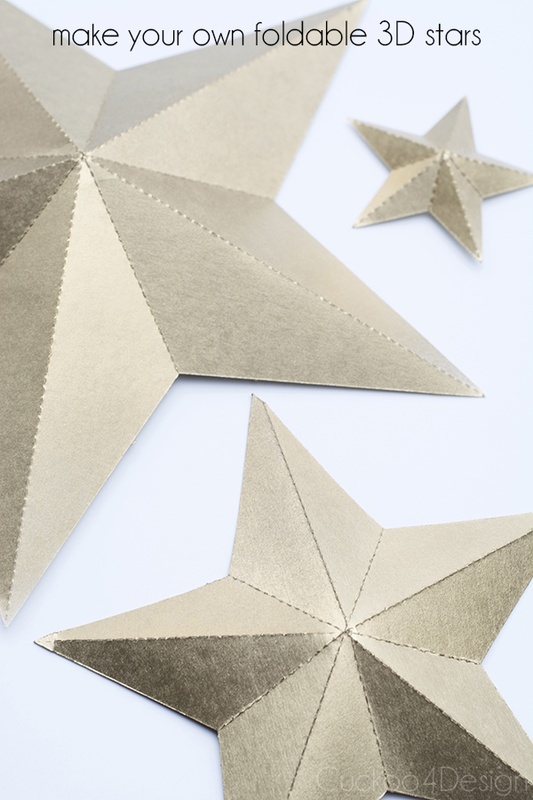 Love these stars and I’ll have to try them on the silhouette. What a fun idea. 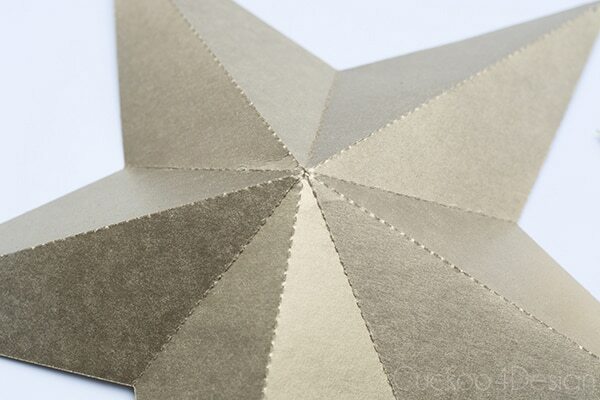 I hand folded stars a few years ago and it wasn’t nearly as simple. Thanks Kim and don’t worry, I’m behind too. great post! i love the painted ornaments and dishtowel as well, will try this! Thanks so much Genevieve, and good luck trying all the projects. A question because I can’t open the file – what kind is .studio? It doesn’t open on my laptop and I absolutely love these! So sorry, I missed your comment. .studio is a file you can use with the cutter but you should be able to open it in other programs as well. I have to double check it.